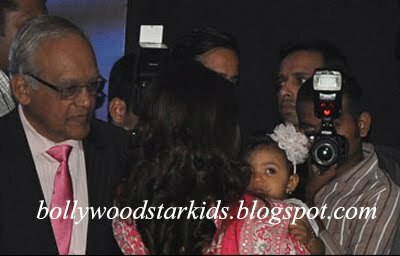 Aishwarya and Abhishek Bachchan's baby daughter Aaradhya was spotted along with her parents and grandparents at the event held to felicitate Aishwarya. Aishwarya Rai's baby daughter Aaradhya, who will turn one year old this month (On Nov 16 2012), made a very cute picture with her mum who celebrated her 39th birthday on November 1, as she received the Officer Dan Ordre Des Arts Et Des Lettres, a French civilian award for her contribution to the arts in Mumbai. Even as Aishwarya Rai Bachchan accepted the French honour, the highlight of the event, was little Aaradhya Bachchan, who was present to share this occasion with her mother. Dressed in a frilly white frock and a cute hair-band, she looked quite the belle as she posed with Aishwarya. 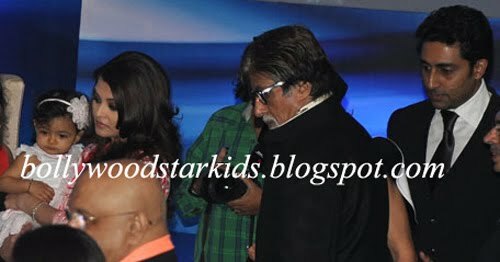 Aaradhya, born November 2011, has been clicked by shutterbugs on a few occasions before - when Aishwarya went abroad, when she travelled to Chicago and the most recent being at grandfather Amitabh Bachchan's 70th birthday bash on October 10 in Mumbai (View All Pictures of Aaradhya Bachchan Here). 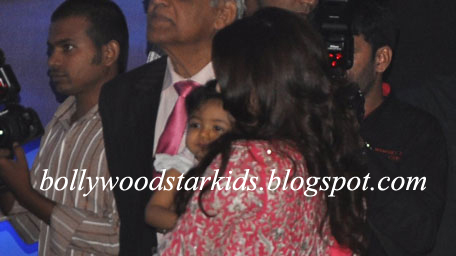 Aishwarya Rai Bachchan With Daughter Aaradhya Bachchan at the Event to Felicitate her With the French Award. Aishwarya's lil baby Looked Cute in a White Dress With a Bow to Match. Aishwarya Rai Bachchan With Baby Daughter Aradhya Bachchan at the Event to Felicitate her With the French Civilian Award. Aishwarya's lil baby looked cute in a white dress with a bow to match. 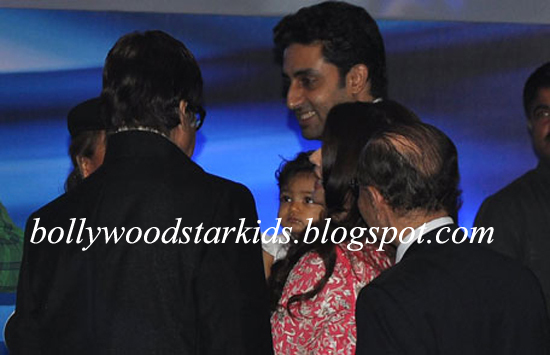 While Aishwarya Rai was on the dias, daddy Abhishek Bachchan Was Carrying lil Daughter Aaradhya. her looks & colour is like her dad not like her beautiful mom Aish.She looks pretty ordinary kid. ini cooper for one year old baby???? ?Is it a great stuff? I am also a fan of Amitabh Bachchan but this type of news are nothing else only to show off the Bachchan family's money power. No doubt celebration of their child's birthday is a special occasion for the parents. But instead of gifting cars to one year old baby which is totally senseless on my part, the Bachchan family should go for some charity for the needy & Poor people and i think which may a great work for inner satisafaction. I am mothing and stand nowhere to criticises such acts of Bachchan family, but this is my personal thinking and may be i may be wrong. 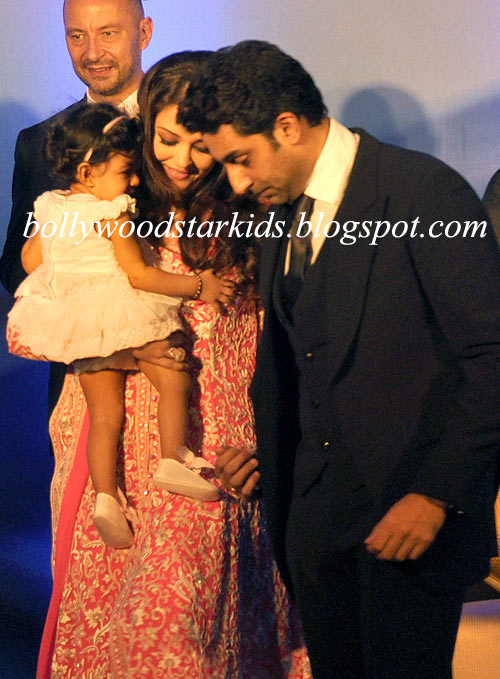 Baby Aaradhya looks sooo cute but mommy Ash looks like a botoxed grandma in these pictures. The mum is so beautiful & always will be to the western people like me that know and have heard of her. She should have chosen a better looking guy for a good gene to pass to her kids. Her off spring is nothing special.